This is our fourth--FOURTH!--summer up here in Michigan. Sometimes I find that difficult to believe, but that is neither here nor there and certainly not what this post is about. Each summer Joel and I have been blessed to be involved with opera productions through the Pine Mountain Music Festival. But this summer I was particularly honored to be invited to be a guest artist with them. Due to budgetary difficulties rampant in arts organizations across the entire country and not just our music festival (support your local arts or they will go away! ), there was no opera produced this year. Instead, the main operatic production was a concert of Verdi arias called Viva Verdi! My role in the festival was to perform in the opening galas, the Broadway Revue, and the Verdi concert along with the four young artists who came up for the festival. We also ended up singing Sibelius' Finlandia with the "Finnharmonic" orchestra conducted by none other than my very own Maestro (the music festival took place during the same time as the International FinnFest, which was held in our area this year). 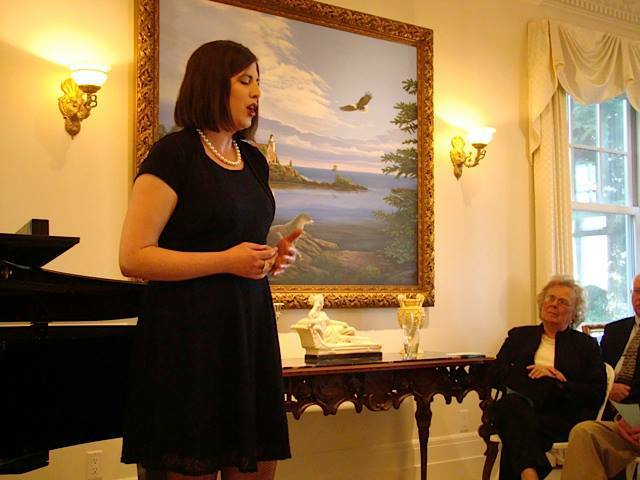 For the galas I was asked to sing an opera aria (O Mio Fernando! ), a Broadway song (Someone Like You from Jekyll and Hyde), and an opera duet with one of the other singers (The Flower Duet from Lakme). I received a huge pile of music to learn for the Broadway Revue which included numbers such as My Funny Valentine, What'll I Do?, My Romance, and a whole bunch more. And for the Verdi concert I was asked to sing Desdemona's Salce, Salce/Ave Maria from Otello, a very cool Verdi song that isn't from an opera, and Alice's part in the women's quartet from Act I of Falstaff. I received all of these assignments about six weeks before rehearsals were to start. You all know my penchant for being stressed about these things. I've been working really hard to NOT get so stressed over it, and to remember why on earth I enjoy singing and performing in the first place, but I was still a little tiny bit overwhelmed. Okay, so I was a lot overwhelmed. But I made it through, and I didn't freak out like I did the last time. I really did learn something from that experience! And I had an amazing month in which I grew more as an artist in four weeks than I probably have in the 15 years since I graduated from college. While my intense allergies to tree pollen and the intense tree pollen in my area hindered my singing for the galas and the revue, I was incredibly blessed and I made it through. I was upset that it wasn't my best singing--there's nothing quite like opening your mouth to sing words but having a coughing fit instead!--but I know it was the best I could do with what I had right then. And boy, you should have seen the pharmacy I lugged everywhere with me! Antihistamines, neti-pots, zinc lozenges, mucinex, prescription cough suppressants, two kinds of asthma inhalers, essential oils, and more! My mom came for the busiest week and brought with her a tree pollen antigen, and I think that made all the difference. By the Verdi concerts I was back to my normal singing self. Thank goodness. Because I don't think I could have faked Verdi like I had to fake Cole Porter. And the Verdi concerts were some of the best singing I have ever done. I was by no means perfect--I'll shout it from the rooftops if I ever have a perfect performance--but I was really pleased with the outcome. And now we will abruptly segue into some photos...not one of which was taken with my nice camera. It's pretty much all iPhone all the time nowadays. Sigh. Oh, but these first ones were taken with somebody's nice camera, so there's that. Singing O mio Fernando! at the third opening gala. Two of the galas were held in amazing homes with amazing views. Singing the Flower duet from Lakme with J--an incredibly talented soprano. This is a photo of the artistic director of the festival. He is an opera director, and I am so thankful for how hard he pushed me this summer. It wasn't easy, but I grew immensely and I am excited to continue to push myself in future performances. Lucy--sitting next to the accompanist--was also a great inspiration to me this summer. Love them both! Taking our final bows together. I have no idea why I am including this photo because I look like a total dork. All of the young artists and me after the first gala, also held in a home. Yes, I often felt like a giant with these two petite girls, but maybe I shouldn't wear 5-inch heels, either. When Joel first saw this photo he called me "Lara Bunyan." The opening number to our "Revue of Revues" featuring From This Moment On by Cole Porter. Me singing My Funny Valentine. That's Jerry at the piano and he was another person who was so amazing to work with. I am just so lucky! The format of the show was to be in a diner like atmosphere as we performed. If we weren't singing, we were usually sitting at the table watching those who were. It was fun to have Lucy join us for the last part of the show. All of us after one of the four performances of the revue. After our final Viva Verdi! concert in Marquette. I love how we all chose purple/black gowns. I think Bob Ross would call that a "happy little accident." The man in the middle was our accompanist and vocal coach for the Verdi. An amazing musician who gave me a lot to think about musicianship in my singing. This summer included a lot of late night partying after concerts were over. I have eaten dinner after 10 pm so much this month that I don't know if I'll ever recover! I so enjoyed getting to know and performing with these four young artists. They all inspired me and taught me how to be a better performer myself. Have I mentioned how lucky I am? Well, just in case I haven't, I am super lucky! I have many other stories to tell, and I have suddenly found my schedule rather free after last night's final concert! I'm not even teaching very many lessons this summer. So perhaps I will return to a more regular blogging schedule and actually finish blogging about last year's summer vacation! Oh wait, I probably won't. But don't be surprised if I do! And also, if you want to win a CD of beautiful violin music, hop down to the next post and enter. I will be choosing a winner this week and so far the odds look pretty good. Here's to music and to summer and to a summer full of good music!